This week will test whether the internationally recognized government of Libyan Prime Minister Fayez al-Sarraj can actually suppress the disorder threatening its continued legitimacy and stability, or whether the country has any hope of holding promised national elections by year’s end—or maybe ever. Earlier this month, dozens died in Tripoli in militia crossfire. On Sep. 10, gunmen attacked the National Oil Corporation’s headquarters, and rocket attacks closed nearby Mitiga Airport two days later. On Sep. 16, al-Sarraj ordered local militia brigades to join forces with the Interior Ministry to establish security, protect residents, oversee a cease-fire and refer intra-militia disputes to a new committee. Meanwhile, he warned that promised national elections should likely be postponed given the chaos. Field Marshal Khalifa Hifter—military leader of the al-Sarraj government’s biggest rival based in Libya’s east—suggested the elections take place as scheduled and that he would honor them, so long as the results were “fair.” For months now, Hifter has been hinting that his forces may swoop into Tripoli anyway. 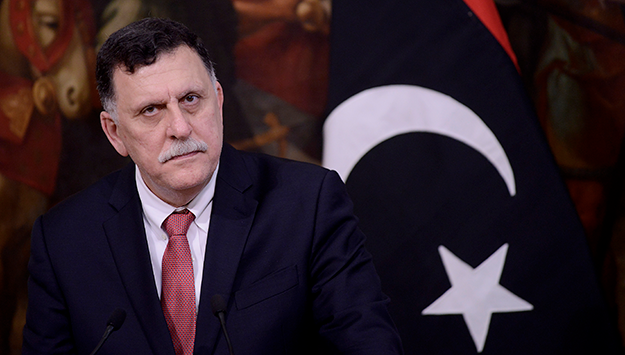 Will Tripoli’s principal military forces honor al-Sarraj’s authority, stop the fighting and reopen the airport? Will that put elections back on track? Any chance of success will require the United Nations’ lead on Libya, Ghassan Salame, to motivate international actors still active in Libya to use their influence to help al-Sarraj restore stability and allow plans for elections to proceed—at least eventually. The alternative is grim: If democratic and diplomatic solutions vanish, there are many forces already seeking to fill the vacuum. After success in forestalling a major Syrian government attack against Idlib province so far, Turkish President Recep Tayyip Erdogan is meeting Russian President Vladimir Putin on Sep. 17, their second meeting in ten days. In Berlin, last Friday, Russian Foreign Minister Sergey Lavrov said that Moscow wants to stop small attacks against its forces launched out of Idlib—particularly drone attacks. The Russians, however, are moving carefully: They want to maintain positive momentum in bilateral relations with Turkey, and they need Germany’s help to assemble resources to rebuild Syria’s shattered economy. Syria’s other key military ally, Iran, is also hesitating on Idlib. In contrast to harsh rhetoric earlier in September, the Iranian Foreign Ministry spokesman emphasized on Sep. 17 that Iran would not participate in an attack on Idlib, and it hopes terrorists there could be removed with minimal harm to the civilian population. Turkey, meanwhile, has steadily strengthened its forces at a dozen forward posts in Idlib, warning that any attack against its troops would provoke retaliation. Turkish-aligned rebels in Idlib claimed they had received fresh military supplies from Turkey. Washington’s warnings to Moscow and Damascus, some intentionally vague, may also be giving Putin and Syrian President Bashar Assad pause. Aside from earlier strikes in response to chemical weapons use, the United States has never attacked Assad regime forces in western Syria. Any American strike in response to a conventional assault on Idlib would be a dramatic change in U.S. policy. Erdogan aims to use these developments to convince Putin to be patient and give Turkey more time to gradually deal with the al-Qaeda extremists entrenched in Idlib. On Sep. 17, the Iranian Foreign Ministry announced it has received proposals from the European Union that might save the beleaguered 2015 nuclear deal. While details on the proposal are still vague, Tehran says it has no incentive to remain in the deal without guarantees from Brussels that its banking and trade, particularly its crude oil exports, will not be adversely affected by sanctions. Many in Iran, including Supreme Leader Ayatollah Ali Khamenei, wonder if Europe can deliver independently of the United States. Few believe the Europeans are in a position to stand in the way of U.S. President Donald Trump without any hard power. As a result, Tehran policy circles are being flooded by a new wave of calls for Iran to forsake Europe and “look east” to Russia, China and others to help relieve Iran’s acute economic woes. Others are skeptical, including Iran’s envoy to the Organization of the Petroleum Exporting Countries (OPEC), Hossein Kazempour Ardebili. Last week, Ardebili accused Russia, along with Saudi Arabia, of seeking to absorb Iran’s oil market share in the midst of sanctions against Tehran. This public jab at Russia was not accidental. Moscow is so extensively questioned as Tehran’s patron that those close to Khamenei are increasingly on the defensive. Khamenei’s closest advisor, Ali Akbar Velayati, said last week that Iran is aware Russia is taking advantage of sanctions and that the two differ on Syria, among other issues. But Velayati pointed out that, as of Sep. 17, Iran still benefits from Russian hard power and diplomatic influence. From Washington’s point of view, the question is how far is Tehran willing to go to keep this marriage of convenience with Moscow alive.